The long awaited i815 chipset from Intel was the replacement for the mighty and long lasting i440BX we had all become so accustomed to. Was the i815 be able to live up to the reputation of it's predecessor? Unfortunately no. While being a decent, stable and relatively fast chipset, the i815 just doesn't have the "oomph" which BX did at the same bus speeds. There isn't much choice between the two chipsets anymore however. Even though the BX was a faster chipset, it doesn't support many of the modern features we are now accustomed to such as 4x AGP, Ultra 66/100 drive support and 133 MHz bus speeds. After the initial introduction of the i815, three more variants would eventually surface to claim differing segments of the market. The main differences between each of them is varying support for onboard features. For instance, the standard i815 only supports Ultra 66 and comes with integrated video capabilities. On the other hand, the i815E brings the harddrive standard up to Ultra 100. Lastly we have the i815EP chipset which is almost exactly like the i815E except for the fact it doesn't support onboard video. 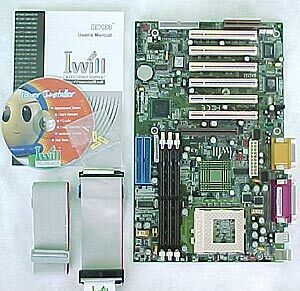 The Iwill BD133 is one of the motherboards on the market which just happens to sport the i815EP chipset. All of IWill's current motherboards seem to be shipping in these cool (yet sensible) boxes. Since I have become quite accustomed to working with AMD-based systems I wasn't quite sure what to expect from the BD133. The first thing that came to my mind was that overclocking wasn't going to be as fun... no more multiplier adjustments and all. Intel like AMD locks all multipliers, but unlike AMD, once their locked you can't do anything about it. With a trusty Pentium III 1.0 GHz FC-PGA processor in hand (Thanks Steve!) I was ready to reach out and test IWill's famous MicroStepping BIOS features and a few other things. Next up, the full specs on this little beauty of a motherboard.